Phil Rudd is, according to Modern Drummer magazine, "the very definition of rock drumming". Malcolm Young co-founder of AC/DC describes his long term bandmate as “the real deal”. Kenny Aronoff, drummer for John Mellencamp says Phil Rudd is “the rock drummer” and Eric Singer of Kiss sings Rudd’s praises as “the heart and soul of AC/DC”. The Australian drummer played in several Melbourne bands, such as Buster Brown and the Coloured Balls, before joining up with rock giants AC/DC in 1975. Over the next four years Rudd powered the band to superstardom with his dogged consistency and unshakeable backbeat on classics like 'It’s A Long Way To The Top (If You Want To Rock ’N’ Roll)', 'T.N.T' and 'Dirty Deeds Done Dirt Cheap'. Phil Rudd is an indelible part of AC/DC history. Rudd, who says he ‘‘went straight down the road to buy my first Ferrari’’ after epic album Highway to Hell went multi-platinum worldwide, has an unselfish drumming style and a humongous groove, earning him the adoration of generations of drummers around the world. Rammstein’s Christoph Schneider said in the October 2010 edition of Modern Drummer, “AC/DC were my absolute heroes because they are simple and easy to copy—though soon you find they are not so easy to copy.” The magazine’s May 2010 issue also chimed in on the timeless rocker with the feature '50 Reasons To Love Phil Rudd'. The veteran musician has appeared on all but three of AC/DC’s eighteen studio albums, which have sold more than two hundred million copies worldwide. "You couldn't find a more solid person or drummer than Phil Rudd" said ex-lead AC/DC vocalist Brian Johnson. The former AC/DC drummer Phil Rudd was desperately missed on recent tours, so much so that long standing bassist Cliff Williams is retiring from AC/DC, citing the fact he misses both Phil Rudd and Malcolm Young. During 2014, Rudd recorded and released his debut album, Head Job, with Kiwi musicians Allan Badger and Geoffrey Martin. The album was released by Universal Music Group in Australia and New Zealand with further promotional plans scuppered by Rudd's well publicised legal problems in New Zealand. "I couldn't be bloody happier with Head Job, to tell you the truth" Phil told Libel Music. "I'm so proud of the album, everything I had to do with it. The guys played really well on it, it's just too good. Really great, mate… I'm pretty happy with the drum sound". With a home detention sentence behind him, and Phil firmly focused on a positive and healthy lifestyle, he will be visiting the UK and Europe on tour to promote Head Job and new single 'Sun Goes Down'. “My hell raising days are over” Phil says. "I see a psychiatrist once a week and I'm closer than ever to my children. I still have all my flash all his cars but now I want to grow chillies". Phil Rudd, now a resident of New Zealand, is renowned for his love of cars, putting his collection to work by showcasing eleven of them in a Christchurch earthquake appeal fundraiser. The exhibition included a rare 1991 Ferrari F40 and a brand new Ferrari 599. Other cars on display included two Lamborghinis, a 2010 Rolls Royce Ghost, 2011 Bentley Mulsanne and Bentley super sport, Audi R8 V10, a 2011 Aston Martin DBS, 2010 Mercedes SLS AMG . The cars have a combined worth of approximately $3m USD. Rudd’s airport hangar is also home to his MD 520N helicopter. The trappings of this Rock and Roll lifestyle are underpinned with a renewed focus on what is most important to Phil these days, his family, friends, music and health. Rudd recently re-signed his long standing drum sponsorship deal with German drum makers Sonor, signalling his determination to develop and record with his new band and continue what is already a remarkable career. He has also signed a new distribution deal with German company SPV. 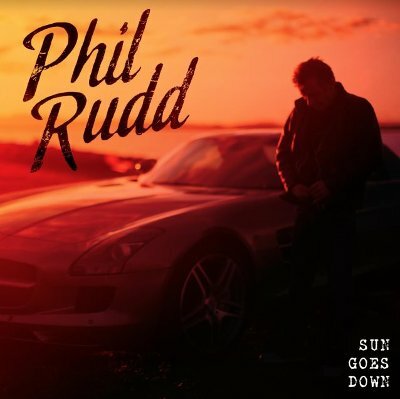 Sun Goes Down will be released on September 29, 2017 and Rudd will be touring the UK and Europe from September 14 to November 6, 2017.